I'm very sorry, but Incredible Ladies doesn't have a search engine which can look through the site to find stuff for you. For the time being it is deliberately kept simple in technical terms. 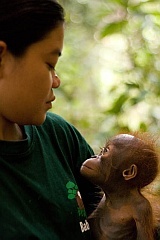 Pickle gets to know one of the foster mothers who will look after him for the next seven years of his life.